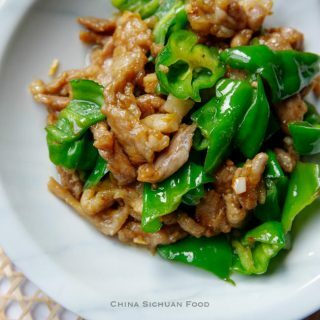 Pork stir fry with fresh green peppers (青椒炒肉)is the national dish enjoy the highest popularity on Chinese table, similar to tomato and egg stir fry. 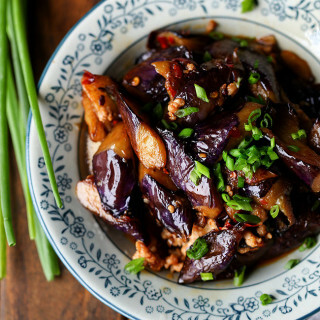 Stir frying is hard to control for lots of people outside China. Due to the high fire, the meat can be overcooked very quickly and thus turns quite hard to chewy. 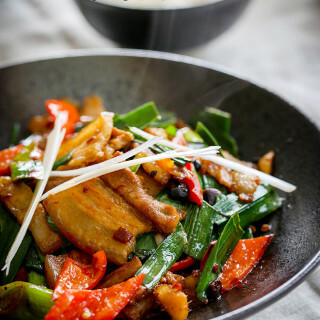 But a perfectly done stir fry is a brilliant dish even it calls very humble and common ingredients. After this post, you can freestyle your pork stir fry with other ingredients, like carrots, celery or red onion. But this is the most classic one. 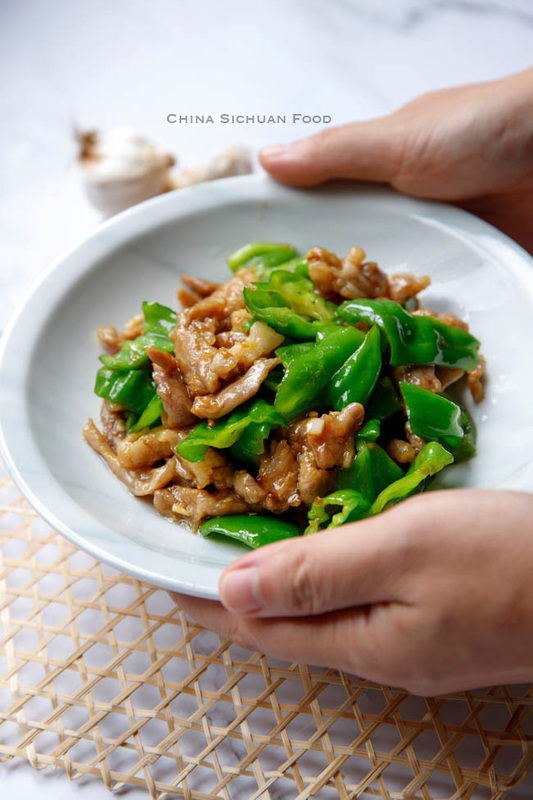 In Chinese stir-frying, we marinating the meat with a couple of ingredients with several purposes. The first one is to give the meat a basic flavor, using soy sauce, salt, white pepper and etc. And the second one is to make the meat juicy itself by adding some liquid. 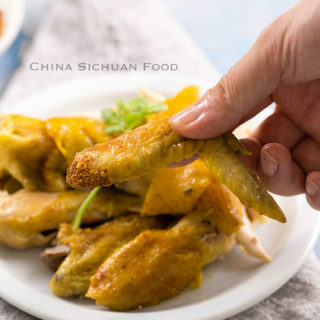 The last purpose is to add a protecting shell with the help of starch to keep the meat from overcooking by the high heat of the wok and keep the juice inside. When meeting hot oil, the starch begins the process of gelation. But when the oil is too hot or the oil is insufficient, the shreds might sticky to the bottom of your wok (since wok is not non-stick cook). So we need to add the pork shreds when the temperature of the oil is not too high. 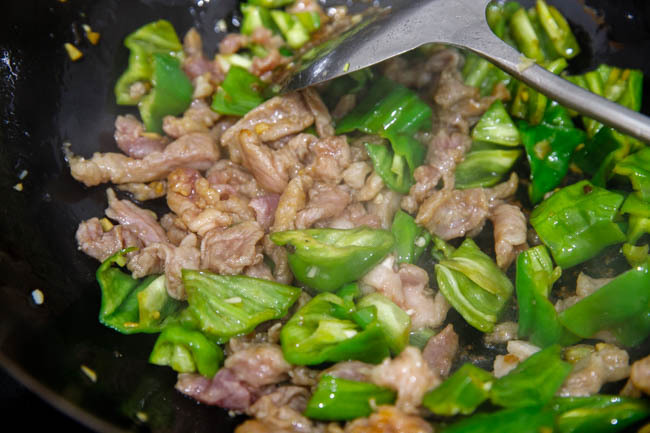 So the basic step for a perfectly done shredded pork stir fry is to heat your wok or pan firstly (so we can remain a relative stable temperature after adding the cold pork). Mix some cold oil with marinated pork (avoid sticking) and add the pork when the oil is warm. 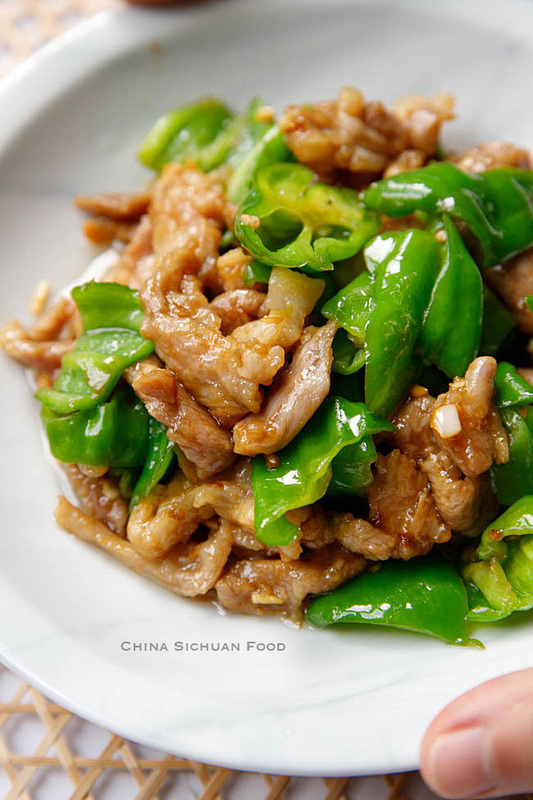 Quickly fry the shredded pork for 6- 10 seconds until the white color turns pale and non-stick. 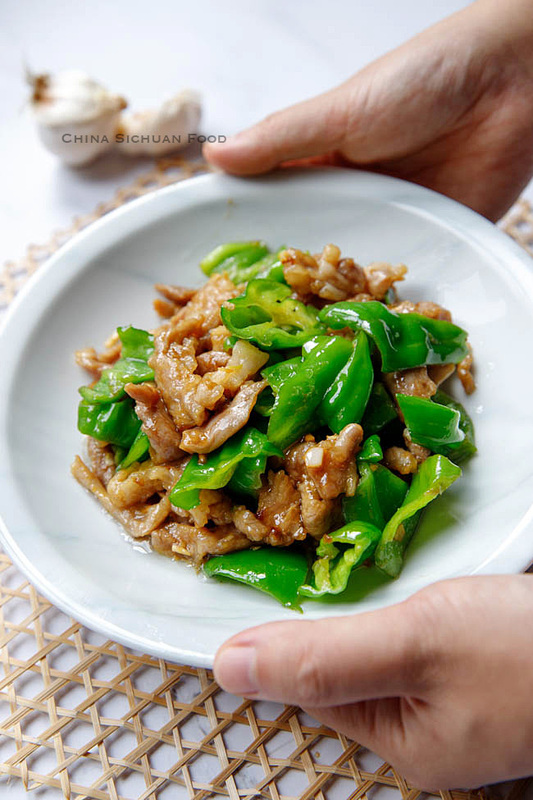 Cut pork into small thin slices. 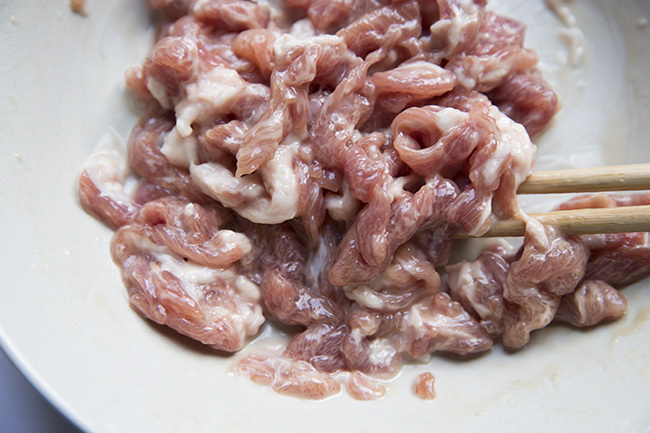 Transfer the pork shreds to a larger bowl, add sugar, salt, white pepper, light soy sauce, water and cooking wine. Combine well and make sure the pork absorbing all the liquid and marinating for at least 15 minutes. Add cornstarch and mix well. Mix in 2 teaspoons of vegetable cooking oil before frying. Heat the wok firstly until really hot and then add oil and continue heating for 30 seconds. Add the pork shreds in and fry quickly for no more than 10 seconds or until the sheds changes turns pale. It is completely ok if it contains some pink inside. 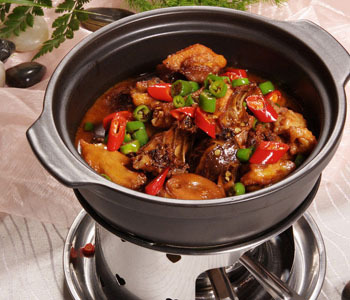 If you are working with an insufficient heat, you can cook the pork in two batches. The remaining heat will continue cook it after transferring out. Transfer out the pork immediately and remove extra oil. Leave only 1 tablespoon of oil inside and fry garlic until aromatic. Place green pepper in, fry for 10 to 20 seconds until slightly softened. Sprinkle a small amount of salt and drizzle light soy sauce around the edges. 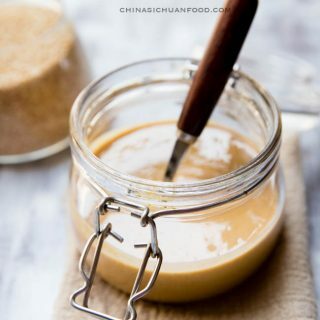 Mix with pork and serve hot. 4 tbsp. water or chicken stock. 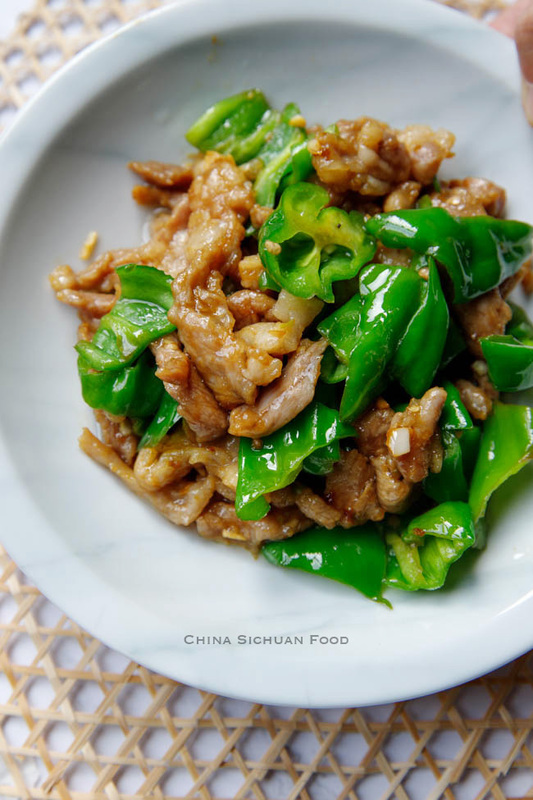 Cut pork into small thin slices. 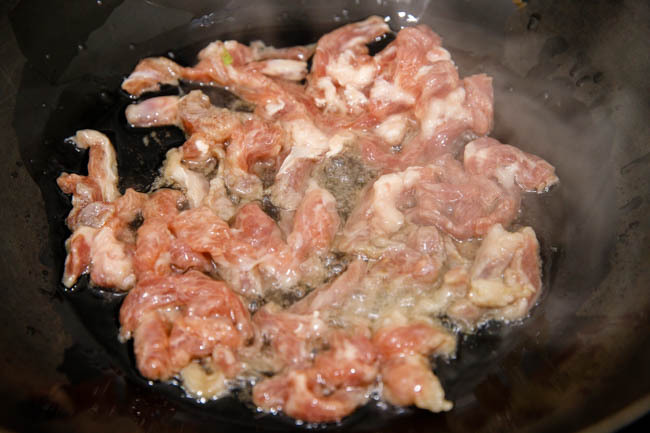 Transfer the pork to a larger bowl, add sugar, salt, white pepper, light soy sauce, cooking wine and water. Combine well and make sure the pork absorbing all the liquid and marinating for at least 15 minutes. Then add around 1/2 tablespoon of cornstarch and mix well. Then mix in 2 teaspoons of vegetable cooking oil. Heat the wok firstly until really hot and then add oil and continue heating for 30 seconds. Add the pork shreds in and fry quickly for no more than 10 seconds or until the sheds changes turns pale. It is completely ok if it contains some pink inside. The remaining heat will continue cook it after transferring out. If you are working with an insufficient heat, you can cook the pork in two batches. 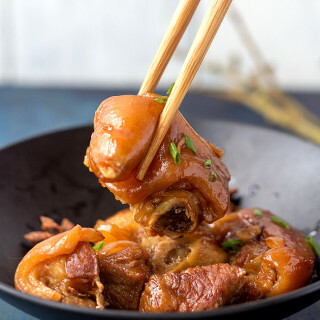 Transfer out the pork immediately and remove extra oil. Leave only 1 tablespoon of oil inside and fry garlic until aromatic. Place shredded pepper slices in, fry for 10 to 20 seconds until slightly softened. Sprinkle a small amount of salt. Return pork and mix well. Serve hot! Exactly what kind of peppers do you use? Plain green bell peppers? In china the green peppers are much different. It is a good question. I believe fresh long peppers or bell peppers all can work. People have different references about that. But the long chili green pepper is my first choice. I only had green and red bell peppers available but added a small amount of fresh chili pepper to compensate. It tasted fantastic. 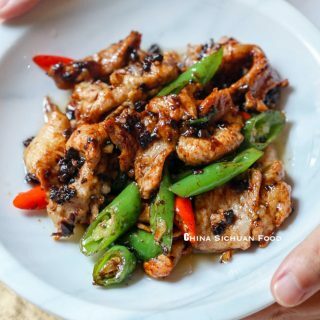 Thank you for another simple and very tasty stir fry recipe. With summer approaching I would be thrilled to see more recipes using some of the leaner cuts of pork like this one. Yes, in summer days, I love leaner meat more. Thanks for the suggestion. Thanks for the catch Peter. I missed the “not”. I mean do not heat the oil until too hot. 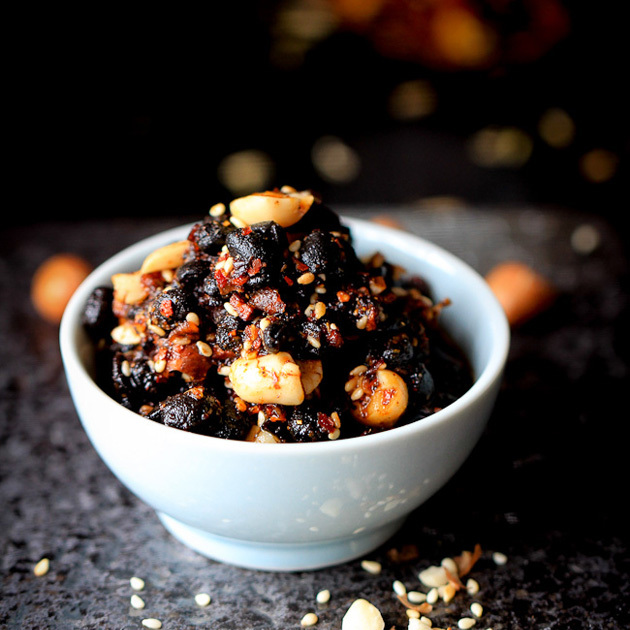 Can’t go wrong with this recipe it’s fairly simple and looks delicious! Who doesn’t like Chinese food? 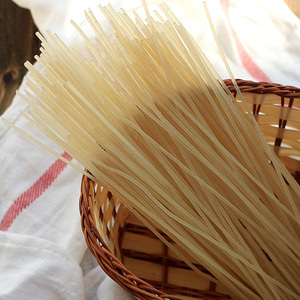 Also great blog so much helpful information and yummy foods! Firstly, thanks for the information abut Shishito peppers. I have checked it and found it is the right type. I use wordpress and genesis theme called foodie pro. You can search and find the information quickly. Hi! I made this recipe last night and it turned out so good! Tasted like something I ordered from the restaurant! Thanks so much for the recipe. Thank you Annie for your great feedback.